There have been "fruitful" discussions on Irish issues at the Brexit talks, the EU's chief negotiator has said. Michel Barnier also said there had been "genuine progress' on the Common Travel Area (CTA). The CTA is a UK-Ireland arrangement allowing free movement of UK and Irish citizens between the Republic of Ireland, NI and the rest of the UK. 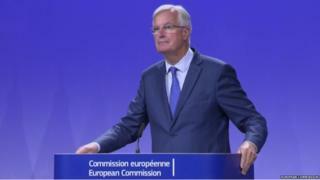 Mr Barnier was speaking in Brussels at the end of the third week of Brexit negotiations with the UK. There has been slow progress on other major issues, including the size of the so-called Brexit bill the UK will have to pay. Mr Barnier said negotiations were still "quite far" away from being in a position to begin talks on future trade arrangements. UK Brexit secretary David Davis said he had a duty to tax payers to "rigorously interrogate" the EU's position on the bill. But Mr Davis said the talks had been "constructive" overall. He said there was a "high degree of convergence" on the CTA, and recognition of the need for joint work on other cross border issues. The Brexit secretary urged the EU to be "more imaginative and flexible" in its approach. Chancellor of the Exchequer Philip Hammond was in Dublin on Thursday, where he met the Irish Foreign Minister, Simon Coveney. Mr Coveney said he had "urged" the chancellor to "listen to those who stand to be most negatively impacted by Brexit across these islands". He said he had emphasised that the UK remaining in the Customs Union and the Single Market was the best way to avoid a hard border. In article for the Irish Times, Mr Hammond said the UK government was determined "to avoid any physical infrastructure" along either side of the border. "Our economies are already closely entwined. Our businesses operate across the land and sea borders, and so do our people," he wrote.